The Golden Girls, the popular 80s sitcom, premiered on this very day in 1985. 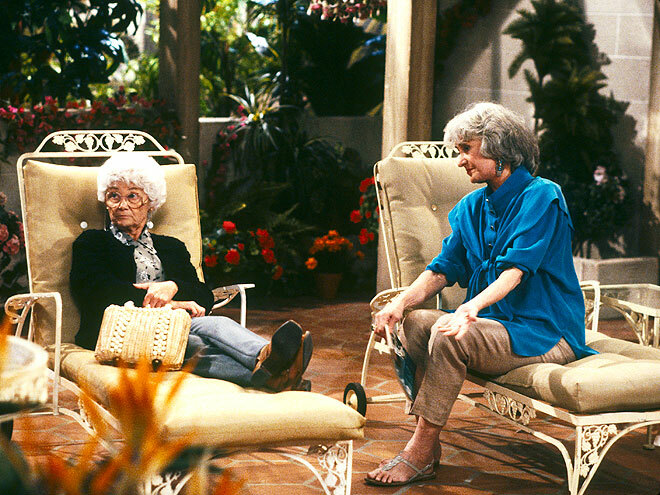 Over the course of 180 episodes, we entered the lives of Blanche Devereaux, Dorothy Zbornak, Rose Nyland, and Sophia Petrillo. Their Miami home was quintessential of its time, yet exuded personality that was totally unique to these ladies. 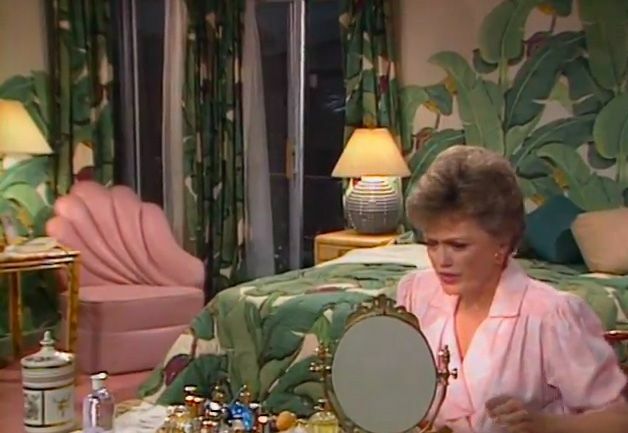 In celebration of The Golden Girls’ 32-year anniversary, here is a look at some of the memorable rooms and a modern take on them. 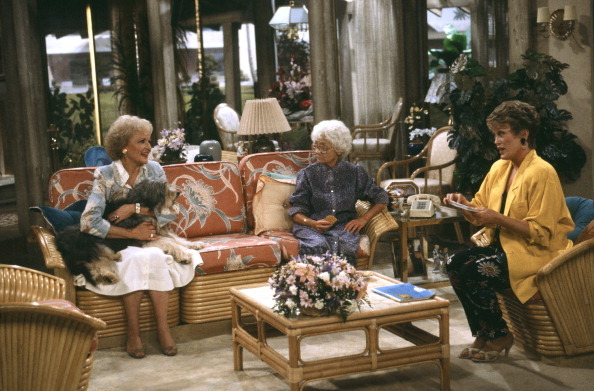 Arguably, the living room can be considered The Golden Girls’ best supporting role; many memorable moments happened in this room. The rattan furniture, a prominent fixture, is getting a serious second wind. Due to its malleability, rattan can be formed into graceful, statement making pieces. Plus, it’s lightweight – no heavy lifting required! 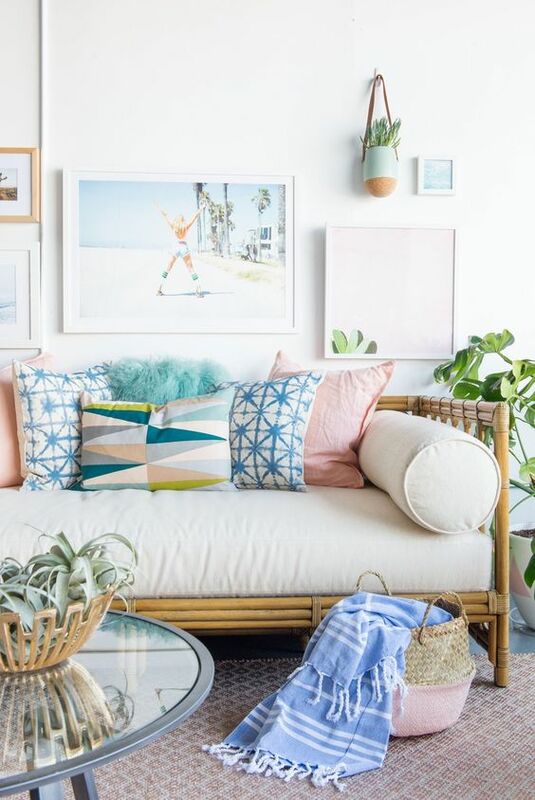 Go for a clean look and accessorize with fun, patterned pillows for a charming living room. Talk about glamorous! The palm leaf headboard, pink shell chair, and vanity make for a posh boudoir. The oversized leaf pattern is trendy and makes a bold but not-too-overpowering statement. A modern take ditches the pink in favor of warm wood tones and white for an airy look. Cheesecake, anyone? These gals shared plenty of it over life dilemmas and St. Olaf stories! The kitchen’s eclectic decor had just as much personality as the Golden Girls combined. While the wicker chairs and round table are reminiscent of the 80s, the handmade artwork and plants abound give a modern and homey feel. Whether unwinding at the end of the day or enjoying Miami’s warm weather, the Lanai served as getaway of sorts. The wrought recliners are classy and chic. 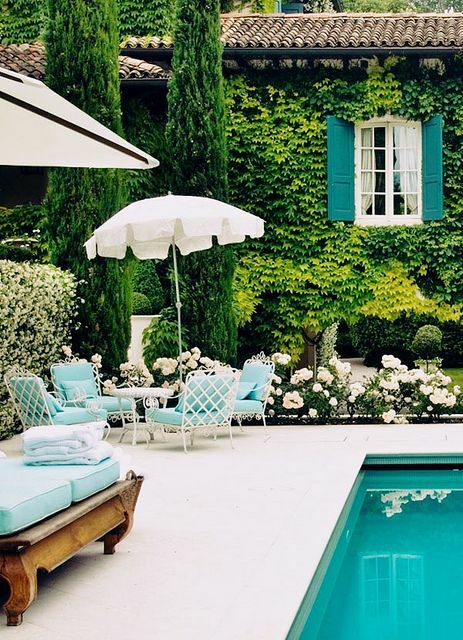 With a pop of color on the cushions, they instantly become a poolside-worthy centerpiece.